At BioSig Technologies, we are dedicated to developing new ways to help patients and physicians. Our first product is the PURE EP™ System, a system designed for use in the large and growing electrophysiology market. Second center to report positive clinical experience with PURE EP(tm) System. BioSig has signed an agreement with Mayo Clinic to become the second leading institution to use the PURE EP™ System. Company provides updates on recent developments and highlights plans for future growth. Bioelectronic medicine is a new, rapidly growing field of healthcare that explores how targeted electrical signals in the body can help to diagnose and treat a wide range of diseases, from diabetes to depression. BioSig aims to play a vital role in the field of bioelectronic medicine, based on our unique enabling technology and core competency in signal processing. Our initial focus is on heart disease and the fast-growing electrophysiology device market. Arrhythmia, a common cardiac condition, causes the heart to beat too quickly, too slowly, or erratically. New signal processing technologies could play a key role in enhancing outcomes from one of the most important treatments for arrhythmia: catheter ablation. The health and economic impacts of arrythmia are immense. The most common arrhythmia, atrial fibrillation (AFib), affects 33 million people worldwide* – generating annual healthcare costs of $15,000 to $25,000 per patient*. Treatment of AFib and ventricular tachycardia typically starts with drug therapy, which is often ineffective, particularly in the later stages of heart disease. Catheter ablation often fails, leading to costly repeat procedures. Clearer signal information may help physicians work faster and more accurately during catheter ablation. One of the main reasons for low ablation success rates is unreliable information – specifically, the inability to differentiate between the clean signal and lab noise. 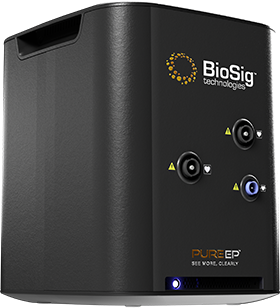 By improving signal clarity, BioSig’s PURE EP™ System has the potential to deliver valuable advances in electrophysiology procedures. We recently conducted first clinical cases at the Texas Cardiac Arrhythmia Institute under the leadership of Andrea Natale, M.D., F.A.C.C., F.H.R.S., F.E.S.C., Executive Medical Director, Texas Cardiac Arrhythmia Institute at St. David’s Medical Center. According to Dr. Natale, early results suggested improved cardiac signal detection and fidelity - click here to read the announcement. How Does Pure EP™ Work? BioSig is working with leading experts and organizations to develop additional features of PURE EP™ and explore signal processing applications in disease areas beyond arrhythmia. We’re proud of our high success rate for peer-reviewed publications: 9 of the 10 publications we’ve submitted to date have been accepted. These publications provide early evidence that PURE EP™ could offer valuable improvements in signal clarity during electrophysiology procedures. In 2017, BioSig signed a 10-year strategic collaboration with experts at Mayo Clinic to jointly develop our signal processing technology. These experts see the potential for our technology to help them electrically map the entire body, possibly leading to diagnosis and development of new therapies in other disease areas – for example, neurology and ophthalmology. BioSig is a NASDAQ-traded company with a clear path to commercialization and growth, proven credentials for success, and a world-class leadership team. Check out our Investor Resources for financial and governance information, stock performance, SEC filings, and other materials.